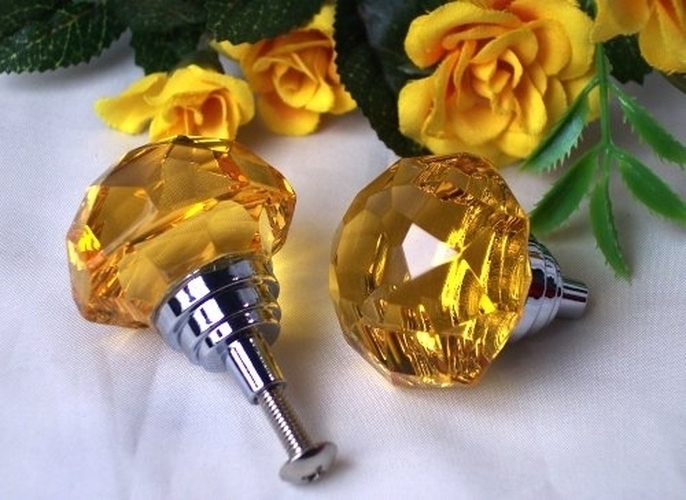 LARGE Amber Solid Crystal Drawer/Door Pull - You will be so impressed when you actually hold this imported crystal knob in your hand. They are a superior quality and come individually boxed in a full color box. They are solid, not hollow. The brilliant colors actually sparkle like diamonds from the "diamond cuts" made in to each piece. These are not found in your normal hardware stores, and if you do find them they will cost over $10.00 each. Measures 1 3/8" wide, x 1 1/2" long. The back of the knob has different insets that will neatly seat into various size holes.